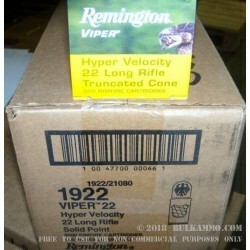 Varmint hunting and backyard plinking are especially fun with this .22 LR Viper ammo from Remington. The 36gr truncated cone solid bullet (TCSB) has features that make it especially effective for hunting small varmint animals. The flat nose of the projectile makes lethal wound channels in soft tissue. The solid bullet construction helps it penetrate deeply. The risk of over-penetration is possible with these rounds, so always be aware of your surroundings when plinking in your backyard. The TCSB is a great bullet option for shooters in areas where hollow points are prohibited. Shooters using this .22 LR Viper ammo for target practice will enjoy the distinctive round holes they punch in paper targets. 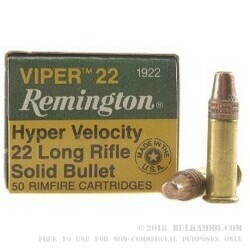 These hypervelocity rounds fire at approximately 1410 fps and provide pinpoint accuracy at long distances. The rimfire-primed casings are made of new-production brass.